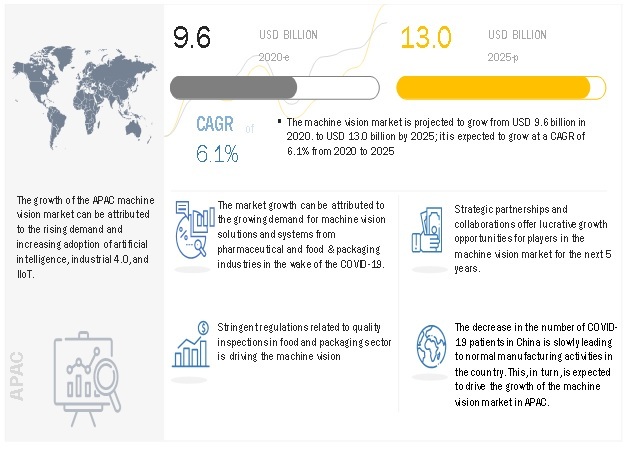 [168 Pages Report] The overall machine vision market was valued at USD 7.18 Billion in 2016 and is expected to reach USD 12.29 Billion by 2023, at a CAGR of 7.61% during the forecast period. The research methodology used to estimate and forecast the machine vision market begins with capturing data on the revenue of key vendors through secondary research. The vendors’ offerings have also been taken into consideration to determine market segments. The bottom-up procedure has been employed to arrive at the overall size of the machine vision market from the revenue of key players. After arriving at the overall market size, the total market has been split into several segments and subsegments that have been verified through primary research by conducting extensive interviews with key experts such as CEOs, VPs, directors, and executives. The market breakdown and data triangulation procedures have been employed to complete the overall market engineering process and arrive at the exact statistics for all the segments and subsegments. The breakdown of the profiles of primaries has been depicted in the following figure. The machine vision ecosystem comprises machine vision manufacturers, along with R&D, component manufacturers, technology providers, integrators, and end users. The major companies operating in the machine vision market include Cognex (US), Basler (Germany), OMRON (Japan), KEYENCE Corporation (Japan), National Instruments (US), Sony (Japan), Teledyne Technologies (US), Texas Instruments (US), Intel (US), Baumer Optronic (Germany), Tordivel (Norway), ISRA VISION (Germany), MVTec Software (Germany), SICK (Germany), and JAI A/S (Denmark), among others. The study answers several questions for the target audiences, primarily which market segments to focus on in the next 2 to 5 years for prioritizing efforts and investments. 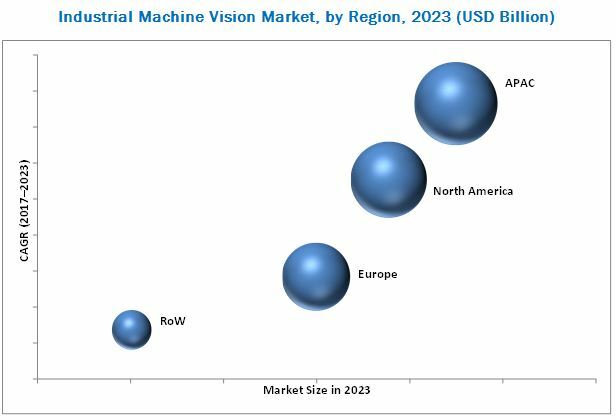 The overall machine vision market was valued at USD 7.91 Billion in 2017 and is expected to reach USD 12.29 Billion by 2023, at a CAGR of 7.61% between 2017 and 2023. The growth of this market can be attributed to the increasing need for quality inspection and automation, growing demand for AI and IoT integrated machine vision systems, increasing adoption of Industrial 4.0, development of new connected technologies, and government initiatives to support smart factories, among others. Governments of different countries worldwide are encouraging investments in manufacturing, which is necessitating the use of various automation products for structural development. The machine vision market for software components is expected to grow at a high rate between 2017 and 2023. The integration of AI in machine vision software is expected to fuel the growth of the machine vision market for software during the forecast period as deep learning enables machines to recognize objects. Also, deep learning-based machine vision software helps in minimizing human intervention and provides a real-time solution by distinguishing the acceptable variations in products and the defects in manufacturing industries. PC-based machine vision systems are expected to hold a major share of the machine vision market during the forecast period. This is because PC-based machine vision systems are the oldest form of machine vision systems, and these systems are simple to handle and have faster processing power units compared with smart camera-based machine vision systems. However, these systems are suitable for use in applications wherein space is not an issue. Though smart camera-based systems have several advantages over PC-based systems, PC-based machine vision systems hold a major share of the market. However, this trend is expected to change with the advancements in smart camera technology and IoT, which can be easily be integrated with smart cameras, and the penetration of the smart camera-based machine vision systems is likely to increase in the next few years. Among all the end-user industries, the market for the food and packaging industry is expected to grow at the highest rate between 2017 and 2023. The food industry provides several opportunities for the machine vision market, and several companies have responded by developing application-specific solutions in the areas of grading, sorting, portioning, processing, and quality checking during processing and packaging. APAC held the largest share of the machine vision market in 2016. The market in APAC is expected to grow at a high rate between 2017 and 2023. The increase in demand for automotive, electronics and semiconductor, pharmaceutical, and consumer electronic products in China is driving the growth of the machine vision market in this region. The ongoing large-scale developments in emerging economies in this region owing to the use of advanced technologies for manufacturing is also contributing toward the growth of the machine vision market in APAC. Countries such as Japan, India, South Korea, and China are mainly driving the growth of the market for machine vision systems in APAC. Factors that are restraining the growth of the machine vision market include the changing requirements of end users with respect to machine vision applications and lack of flexible machine vision solutions. The key players operating in the studied market include Cognex (US), Basler (Germany), OMRON (Japan), KEYENCE Corporation (Japan), National Instruments (US), Sony (Japan), Teledyne Technologies (US), Texas Instruments (US), Intel (US), Baumer Optronic (Germany), Tordivel (Norway), ISRA VISION (Germany), MVTec Software (Germany), SICK (Germany), and JAI A/S (Denmark).